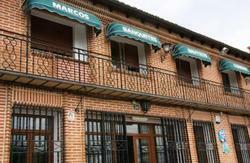 In MARCOS INN brings you modern and convenient facilities with more care service and unbeatable prices. All rooms with outdoors balcony or window. Experience the authentic Spanish cuisine with our Spanish-roast in the oven. And do not miss the specials in our menu, the piglet. Tasty, juicy, crunchy and healthy! Do not hesitate, if you come, repeat! Payment accepted on arrival : cash , credit or debit cards. You can contact the property for prepayment by bank transfer. You can leave your luggage at reception starting at 10:00 a.m. if the room is not ready. Hostal-Restaurante MARCOS, is located in the village of Alaejos, conveniently located on the way to Portugal or the city of Salamanca.